CAMERON, Mo. — With the help of a family who experienced a Holocaust tragedy, a 95-year-old Missouri veteran has opened a special library at the Missouri Veterans Home in hopes it will help teach future generations about World War II. Bill Pollard served overseas in Europe as a member of the Army Medical Corps and witnessed the horrors of war firsthand. On Tuesday, he told 41 Action News about the time he saw the Auschwitz concentration camp after soldiers liberated the site. During his time in the war, Pollard helped evacuate wounded soldiers and get them to hospitals for treatment. After coming home from the conflict, he met a family with ties to the Holocaust who moved to his neighborhood in Kansas City. Decades later, Pollard still keeps in touch with the children of Abe and Helen Greenberg, who lost two of their sons at a concentration camp. 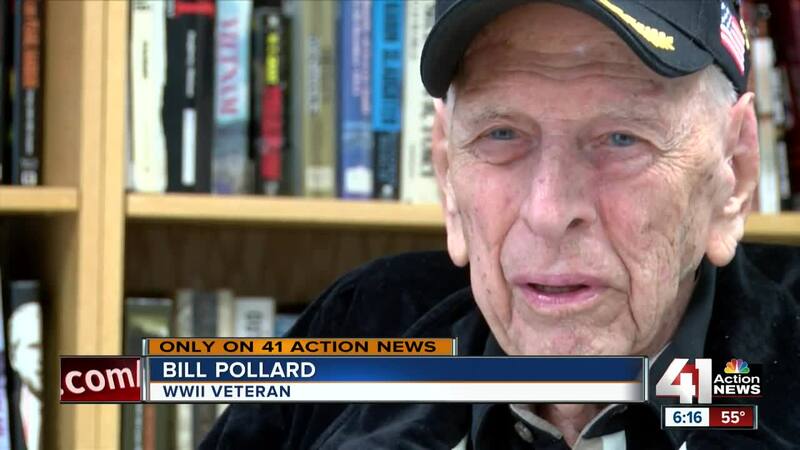 After moving into the veterans home three years ago, Pollard worked with the Greenberg's two sons on a special project to teach future generations about World War II. The Military and Remembrance Library is now open in Cameron, featuring books about American military conflicts and history. On one side of the room, Pollard also has a wall dedicated to pictures of World War II moments and the Greenberg family. With the library still new, Pollard hopes more donations will keep coming in and lead to an expansion. He told 41 Action News that he has already seen the project make an impact. Moving forward, Pollard hopes the library could help others learn lessons from the past. While the books can only be checked out by veterans home residents, the public can visit the library. Book donations can be dropped off at the facility in Cameron. For more information on the project, contact Barbara Caldwell at barbara.caldwell@mvc.dps.mo.gov or at 816-632-1622.